The role and financing of infrastructure to enhance economic growth has resurfaced as a major focus of development researchers and professionals. This column emphasizes the need to consider the potential impact of climate change on infrastructure investment. In sub-Saharan Africa, for example, adopting policies to mitigate damage to new road networks can save billions of dollars in maintenance costs across the continent. Nobel laureate Amartya Sen has observed that ‘even the feasibility of high economic growth is threatened by the underdevelopment of social and physical infrastructure.’ His comment reflects the foundational nature of infrastructure in any society. But while all societies face the challenge of installing and maintaining infrastructure, developing countries are disproportionately challenged. In Africa, for example, such is the scale of the infrastructure deficit that only one-third of people living in rural areas are within two kilometers of an all-season road – the lowest accessibility in the developing world. Similarly, power consumption is only 10% of that found in other parts of the developing world. Addressing this infrastructure deficit is estimated to require an additional $93 billion per year. This kind of sum exceeds the capacity of developing countries and necessitates a role for development banks. Successful infrastructure development in countries such as those in sub-Saharan Africa is further complicated by the disproportionate impact of projected climate change. Multiple projections show that large areas of rural Africa are going to get hotter and possibly wetter. This change in expected operating conditions is likely to lead to substantially greater disruption of infrastructure networks, shorten the expected lifespan of infrastructure, and increase repair and rehabilitation costs. A recent study finds that road maintenance costs in Africa could increase by 270% and $83 billion in hydropower generation could be lost due to changes in temperature and precipitation. The projected impact of climate change on infrastructure in developing countries mandates development banks and developing country governments to look to the future when planning infrastructure investment requirements. It is no longer viable to look only at the past. Indeed, building infrastructure that meets the need of a past environment places an additional burden on developing countries. Specifically, in addition to addressing annual maintenance needs, governments will face additional maintenance requirements introduced by temperature-induced road cracking and increased road washouts in rural areas. To illustrate the issue, we use results from the recent World Bank-funded study on sub-Saharan road infrastructure, which analyzes the climate impact on 2.8 million kilometers of roads, including new road investment in the Programme for Infrastructure Development in Africa (PIDA). The multi-year study analyzes existing road maintenance requirements, possible future maintenance requirements under multiple climate scenarios, and possible strategies for reducing climate change impact. 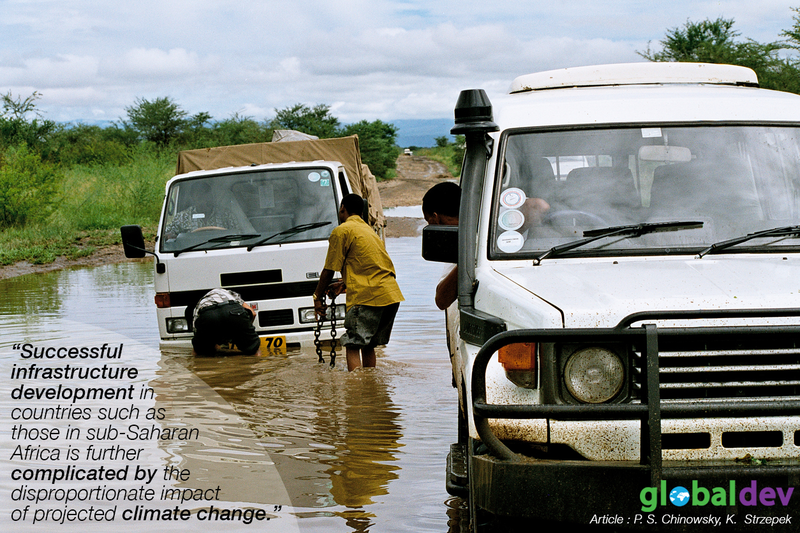 The study determines that across sub-Saharan Africa, the average of the additional maintenance costs (across climate scenarios) of climate change is estimated at $56 billion for 2015-50, compared with historic climate costs of about $15 billion. There is also the potential for significantly greater costs, perhaps as much as three times the average. The study shows that maintenance costs associated with all three stressors – temperature, precipitation, and flooding – are projected to increase relative to historical costs, particularly costs associated with flooding. Across the PIDA network, the highest costs are associated with projected changes in precipitation (the average estimated cost is $32 billion for 2015-50). This is because changes in precipitation have serious impacts on unpaved roads, which represent nearly three-quarters of the road network. Over the spectrum of climate impacts, the estimated costs can be as much as ten times higher than historical costs. The maximum risks of inaction to projected climate change are clearly very much larger than historical maintenance costs. The challenge for developing countries is what can be done to address the combination of infrastructure deficit and projected climate impacts. As a starting point, they must explicitly recognize that infrastructure development is an integral part of a developing country’s economic success. This connection has been documented and advances are occurring, albeit slowly. But the risk associated with ignoring projected climate change impacts on infrastructure must also be acknowledged and the investment banking community must make a change in investment policy. The sub-Saharan Africa road transport study finds that adopting policies to mitigate damages can save billions of dollars in maintenance costs across the continent. The challenge for development banks is whether the investment community is willing to address the potential changes in future operating environments. Although it is commendable that infrastructure is being put in place, infrastructure that places an additional burden on developing countries is only a partial investment. Dr. Paul S. Chinowsky is a Founder and Co-Director of Resilient Analytics™ and a Professor in the Department of Civil, Environmental, and Architectural Engineering at the University of Colorado. Dr. Kenneth Strzepek is Professor Emeritus of Civil, Environmental and Architectural Engineering at the University of Colorado at Boulder, and a Visiting Professor of Economics and Affiliated Professor in College of Architecture and Planning at the University of Colorado at Boulder. Good. Very vital topic of infrastructure for climate resilience is discussed. In the context of disasters across the globe this assume special significance.